We’re very excited about the new Private Stock Model series, it has to be said..
Brought to you by the same team responsible for the pinnacle of PRS’s output (the ‘fantasy spec’ Private Stock ‘Built To Order’ guitars), the new Private Stock Models are a range of six instruments with predetermined spec options, built using the highest quality materials available. And because they’re built in small batch runs, the Private Stock Models come with lower price tags than their ‘one-off’ cousins (from £5995 / €6995 to £6995 / €8495). McCarty Singlecut – a direct reflection of Ted McCarty’s work on solidbody guitars in the 1950s and everything he taught Paul Reed Smith decades later. Features include a McCarty Sunburst carved figured maple top, thick mahogany back, 24 1/2” scale length, 22 fret “Pattern” mahogany neck, figured maple bound Madagascar rosewood fretboard, Madagascar rosewood headstock veneer, mammoth ivory bird inlays and headstock eagle, plated nickel/silver 57/08 pickups with two volume and two tone controls with a 3-way toggle pickup switch on the upper bout, the trademark Santana headstock shape, bone nut, PRS Phase III locking tuners, “flat jumbo” fretwire, custom–machined PRS two-piece bridge, nickel hardware, and a paisley hardshell case. 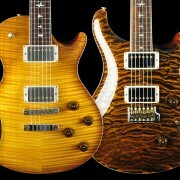 Custom 24 – the Private Stock Model interpretation of the quintessential PRS guitar, with 53/10 humbuckers. Features include a McCarty thickness African ribbon mahogany body, Madagascar rosewood fingerboard and headstock veneer, “Pattern Regular” carve mahogany neck, green ripple abalone birds inlays with Mother Of Pearl outlines (neck and headstock), 53/10 treble and bass humbuckers with volume and tone controls and 5-way blade selector switch, gold/nickel PRS tremolo, Phase III locking tuners with ivoroid buttons. Tremonti – a beautiful take on Mark Tremonti’s signature guitar with Private Stock grade mahogany body and neck and abalone/Mother Of Pearl birds inlays. Private Stock model features include Private Stock grade mahogany body and neck, Madagascar rosewood fingerboard, “Pattern Thin” neck carve, green ripple abalone birds inlays with Mother of Pearl outlines, Tremonti treble and bass pickups with individual volume and tone controls and 3-way toggle selector switch, nickel PRS tremolo with trem up-rout, Phase III locking tuners with ivoroid buttons. Santana #2 – the distinctive outline of the regular Santana model with some stunning touches including abalone Private Stock Eagle headstock inlay and original Santana treble humbucker with 57/08 bass humbucker. Features include Private Stock grade mahogany body and neck (with Santana neck carve), Madagascar rosewood fingerboard, green ripple abalone “old school” birds fretboard inlays, green ripple abalone Private Stock Eagle headstock inlay, original Santana treble humbucker, 57/08 bass humbucker, volume, tone and 3-way toggle switch, nickel PRS tremolo, Phase III locking tuners and Madagascar rosewood ‘OM’ symbol trussrod cover. Paul’s Guitar – carrying on the tradition of the PRS Modern Eagle, Paul’s Guitar is based on the instrument that Paul currently uses on stage and in the studio. Private Stock Model features include Private Stock grade mahogany neck and body, Private Stock grade Madagascar rosewood fingerboard, “Pattern” neck carve, green ripple abalone birds inlays with Mother Of Pearl outlines (fingerboard and headstock), Paul’s Guitar treble and bass pickups, volume and tone controls with 3-way toggle selector and 2 mini coil-tap switches, nickel PRS tremolo, Phase III locking tuners with ivoroid buttons. Violin II – treated to the glorious glowing amber/gold ‘Violin’ finish, the Violin II are rooted in Paul Reed Smith’s belief that the guitar is the violin of our times. Violin II instruments pair curly maple necks with ebony fretboards, “Violin” finish colour (a beautiful glowing amber/gold reminiscent of old violins), and Private Stock’s new “Strad” purfling on the neck and headstock. Features include a carved figured maple top, lightweight mahogany back, 25” scale length, 22 fret “Pattern” curly maple neck, ebony fretboard and headstock veneer, gold Mother of Pearl “Violin” bird inlays and headstock eagle, beautiful “Strad” fretboard and headstock purfling, plated nickel/silver 57/08 pickups with one volume and one push/pull tone control with a 3-way toggle pickup switch, PRS Phase III locking tuners, PRS stoptail bridge with brass inserts (PRS tremolo option available), hybrid hardware, and a paisley hardshell case. 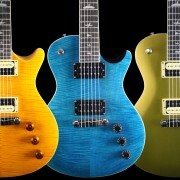 PRS SE Bernie Marsden Ltd Edition Colours! So we’re really excited to introduce no less than five Limited Edition colours for the SE Bernie Marsden in Europe (alongside black, which is now a standard colour option for the guitar). The new limited colours available are Black Cherry, Santana Yellow, Sapphire and Gold Metallic, with spalted maple also a new option. Just how good do they look!? Translucent colours feature a flame maple veneer top, with every version based around a classic mahogany body and 22-fret, 24.5” scale length mahogany neck. Cream body binding and bound rosewood fingerboard set off the simple good looks of the SE Bernie Marsden, which is powered by a pair of SE245 humbuckers, two volume controls, single tone control and 3-way toggle selector switch. Even better, the new Limited Edition colour versions are available at the same price as the original, at just £714 / €869 (inc VAT) including PRS SE gigbag! http://www.prsguitarseurope.com/wp-content/uploads/2014/10/PRS-Bernie-Marsden-LTD-RUN.jpg 1000 2638 prsguitars http://www.prsguitarseurope.com/wp-content/uploads/2014/06/340-300x137.jpg prsguitars2014-10-10 15:57:082014-10-29 10:50:58PRS SE Bernie Marsden Ltd Edition Colours!